This dish reminds me of my favourite weekend ritual whilst living in Switzerland. Almost every Sunday, I would jump on my bike and ride across the Swiss border into France. The marché, an easy 10 km bike ride away, always left my pockets empty and my backpack full of groceries. My favourite seafood stall had everything I loved: fresh oysters, mountains of smoked salmon and of course, plump juicy mussels. Heat oil in a heavy saucepan. Stir-fry garlic and onion until they are just collapsing. Add mussels and stir briefly. Add mustard, followed by beer, then put the lid on. Give the pot a jiggle. Allow to boil over medium heat for about 7 minutes, until the shells of the mussels open. Discard those with unopened shells. Stir in cream at this point if using. Toss parsley into the pot and stir. Serve with a crusty baguette to mop up all the aromatic juices. Note: Mussels should always be cleaned under cold running water, and the whiskers removed before cooking. Give the shells a good brush. I usually soak my mussels in cold water for at least 20 minutes to remove any excess dirt and salt. 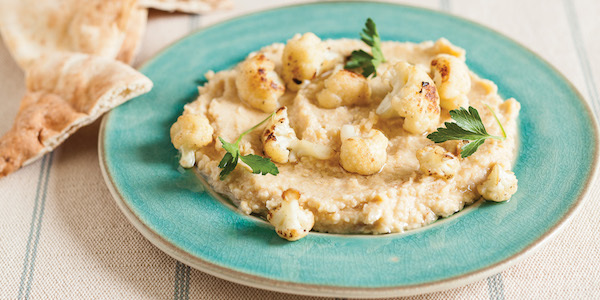 The hummus gets a smoky makeover with crispy cauliflower, which is baked to impart a roasted flavour to this creamy treat. Enjoy smooth dollops of hummus with warm pita bread. Delicious! Preheat oven to 220 ̊C (425 ̊F). Prepare roasted cauliflower. Mix all ingredients, except parsley, on a baking tray. Bake for about 25 minutes, until lightly toasted. You may need to turn the cauliflower florets once halfway through to make sure they are evenly browned. Stir in parsley. In the meantime, prepare hummus. Place chickpeas, peanut butter, cumin, garlic and lemon juice in a food processor. As it blends, stream olive oil, followed by just enough water to get a smooth consistency. Season with salt and pepper and scoop onto serving plates. Garnish with roasted cauliflower and serve with warm pita bread. Michelle Tchea loves discovering new frontiers in luxury travel. As the author of three best-selling books on food and travel, My Little SoHo Kitchen, celebrates her love for NYC. 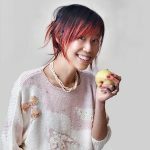 As the founder of PopIntel Group, she is looking forward to the new wave of wellness and luxury travel for foodies.